We are less week away from the end of the open enrollment period, the time when you can sign up for or change your health insurance coverage. If you live in Pennsylvania or any other state where you purchase health insurance from the HealthCare.gov, you must sign up for your 2018 insurance plan by Dec. 15, 2017. This year’s open enrollment period is six weeks shorter than previous years. The health insurance broker I have used in the past sent out an email asking us to start shopping around because the shortened enrollment period will impact the amount of time they would be able to spend helping clients sort through the options. While there have been lots of helpful articles written about the open enrollment period, given that Pittsburgh has become quite the healthcare hub, I wanted to see what the choices looked like in Western Pa. I spent several weeks digging into all of the different options and worked with the team at PublicSource to publish A Pittsburgher’s guide to signing up for health insurance. I’ve tried to summarize the choices in this flowchart but I hope you will take a few minutes to go over to PublicSource and read the entire guide. There are a few things I came across while researching this guide that I thought were interesting enough to share in a blog post. 1. Medicaid led to the desegregation of hospitals. The Affordable Care Act passed in 2010 and this is only the third year for HealthCare.gov; it came online in 2014. I was curious to see when some of the other healthcare programs started. While researching the history of Medicaid, which I was surprised to learn dates back to 1965, I learned that it was Medicaid that led to the desegregation of hospitals. Given that Medicaid has been around for 50 years, I was also surprised to learn that CHIP, the Children’s Health Insurance Program was not created until 1997. 2. Children’s Hospital of Pittsburgh accepts both UPMC and Highmark insurance plans. Speaking of children and health insurance, I was most surprised that there was not more info about this fact anywhere on the internet. Children’s Hospital of Pittsburgh is one of the top 10 best pediatric hospitals in the country. It is also a UPMC facility. One of the biggest things for Pittsburghers to consider when choosing a health insurance plan is network access. I know several women who are planning to have children and choose their health insurance plan to make sure they have access to Magee Hospital. If you have kids, you likely want to be able to take them to Children’s Hospital if needed. I found one mention on the Internet and confirmed this with the Children’s Hospital folks: Children’s Hospital does accept both UPMC and Highmark insurance plans. So when it comes to health care for kids in Pittsburgh, there is a little bit more flexibility. Read more about health insurance coverage for children here. 3. UPMC Everywhere is a relatively new thing. Another interesting change in the local healthcare landscape is the relatively recent presence of UPMC EVERYWHERE. If you look at the Pittsburgh skyline today, the UPMC logo on top of the US Steel building is impossible to miss. But the UPMC Health Plan is actually only 20 years old. According to this 2011 profile from the Post-Gazette, the UPMC Health Plan was started in 1997. UPMC entered the commercial insurance market around the time Highmark created the popular Community Blue, a low-cost, narrow-network health plan that did not include the higher-cost UPMC facilities in its provider menu. UPMC Health Plan was created in 1997 and started selling commercial policies in early 1998, in part to offset Highmark’s market dominance, give UPMC some negotiating leverage and allow it eventually to insure its own employees, as well as those at the University of Pittsburgh. While UPMC has expanded in Western Pa., and the UPMC logo is visible on buildings, buses, and billboards, Pittsburghers may be surprised to know that UPMC is not even one of the top 25 health plans in the United States. There are 34 different plans available in the HealthCare.gov marketplace for people in Allegheny County. Of those, 30 of the plans are UPMC and 4 are Highmark. 4. There is a lot of stale health insurance information on the Internet. I know that websites are not always updated. You can find lots of posts on this blog that need an update (I promise I am working on an update to the recycling guide). But I was surprised how many health insurance guides linked to sites that no longer exist at all. At first glance, this Wall Street Journal site seems to be filled with lots of helpful information, but the site doesn’t have a date and many of the links go to web pages that no longer exist or haven’t been updated since 2014 or 2015. 5. Christian Health Care Sharing Ministries are an option. 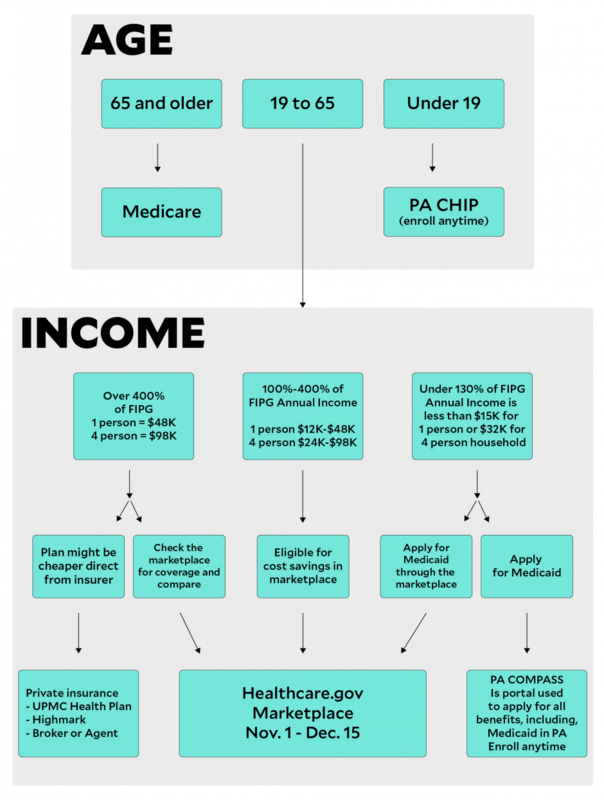 One of my goals in writing A Pittsburgher’s guide to signing up for health insurance was to get all of the options onto one page — everything from Medicare to CHIP to all of the HealthCare.gov options. There was one I almost missed. The Affordable Care Act says that you have to have to be enrolled in a qualified health insurance plan or you have to pay the individual mandate penalty. There are a few exceptions that are mostly granted for extreme financial hardship. There is one other exemption: Christian Healthcare Sharing Ministries. Healthcare sharing ministries are not insurance plans and they can exclude members for pre-existing conditions. To participate, you sign a pledge to uphold the values of the church and join a pool of others who agree to share the costs of health insurance. The concept has gained some notoriety as it has been covered by financial bloggers like Dave Ramsey.